GOODS ARE OFFERED ON A FIRST COME, FIRST SERVED BASIS. STOCK OF MOST ITEMS IS LIMITED. 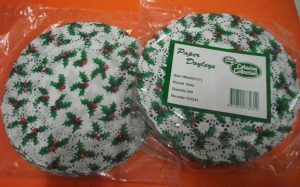 Pack of 30 – 15 each Red/Green. COLOURS: Silver, Gold, Red, Green, Pink. Pack of 110 cards. White lighweight board, folds up to go into a standard envelope. 45mm wide x 30 metres long. Silver or Gold. Copyright © 2009 Marbry Craft Supplies. All rights reserved.